I almost don't want to admit that I started the dear jane quilt. It's been on my radar for several years. I eventually bought the book and it sat on my shelf for a year or more, and then out of the blue last week, I decided to just jump in. I've heard to just take it one block at a time. 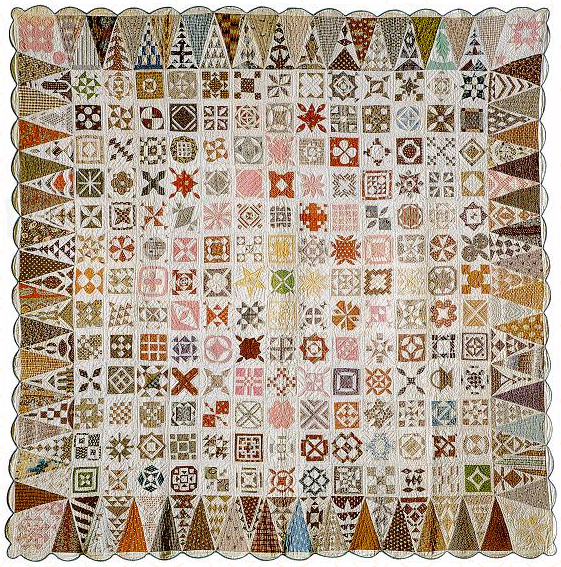 if you aren't familiar with this quilt, you can read more about it here. It really is the most amazing quilt I think I have ever seen, and the reason I'm so nervous to admit that I started it is because these blocks are small (4.5" finished) and have so many pieces--I am not a super precise quilter. It's going to challenge me. I'm a little nervous I'll give up. here's the original, It truly is a work of art. I'm using Anina's tips and tricks. Most of the blocks she paper pieces and since I don't have any freezer paper, I've just worked on the regular pieced blocks so far. They are also the pretty simple ones. Wish me luck...one block at a time. What a cool idea for a layout! It's going to be beautiful. Just take it one block at a time. good luck! even if you don't finish it for years and years it will be amazing to have!!!! ooh, intimidating... but WOW! I bet it'll be beautiful when you're done! Oh I will be cheering you on! I also think that Dear Jane is a work of art! I love the modern rainbow version that you are working on. Good luck to you. It will be a treasured piece of art when you are done. I too am about 6 blocks into my Dear Jane. I plan on following along with your blog to see your progress. Feel free to follow mine, too at http://www.OurHoppyPlace.com. Its a wonderful idea to tell yourself now that your goal is one block at a time. It is a huge undertaking and I would think you could walk away from it for a time without any guilt. I really like your color scheme & look forward to seeing more, but no pressure. Honest! Holy cow, that is one amazing quilt! It will be a fun long-term project. I will definitely have to try the pattern someday. that's gonna be a beautiful dear jane! love all the color. That will be one gorgeous quilt, I love the modern colorsr...it is on my to-do list for a fun long term project! One block at a time and you'll get there! Have fun along the way! That's an amzing quilt. good for you for taking on the challenge! Enjoy the journey! 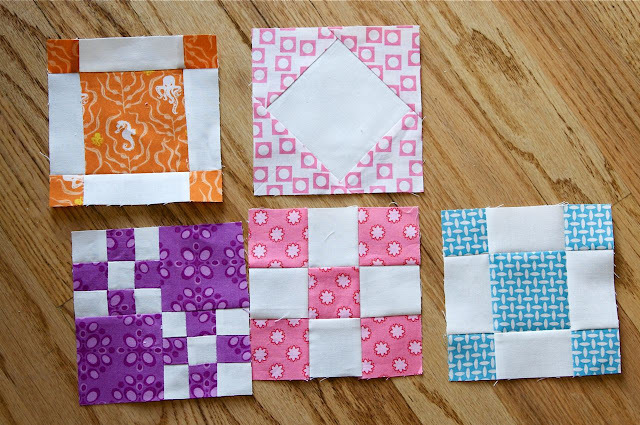 Your piecing accuracy will surely improve as you continue making these little blocks. I really like the sketch with the pastel colors radiating. I've enjoyed Dear Jane's vicariously thru others, LOL! Maybe I'll try one once I finish my Cinqo de Mayo. How beautiful! I love the colors in your plan! I kind of like the idea that you're going to work on a few blocks at a time over a long period of time. I have never seen this quilt before and it does look rather challenging, but it's good to push yourself, right? Good luck!! Aha, another rainbow! But, goodness, this is quite an undertaking. How lovely to be stretched and yet to rest in a pattern at the same time. Enjoy the process! That will be amazing. The blocks you have done are a great start! Despite what the name might have you think, we have members from outside Europe (USA and Australia). Every week a Block and/or triangle of the Week are proposed to the members to make. You do not have to follow this order, but you might if you want to. The group functions quite well. It uses three languages - english, french and dutch (thank god for Google Translator!). Please fell free to come by. Your colour idea looks amazing! I have avague idea that I'd like to do a dear jane in Liberty print one day, but I'm not sure I'll ever manage the commitment! Well done! I bough the book some years ago, and it is something I intend to do at some point (like running a half-marathon). I'll be following you and cheering all along. Go you! Love your color choices. Bit by bit...one block at a time. You'll get there. It's good to push ourselves. QUESTION: Is that a hand drawn & colored mock-up that you've done or have you made it some other way? I have only worked from patterns before and haven't ever 'tried out' my color choices before. But I think this mock-up business is something I would like to try, especially as my patchworking skills improve and I want to venture out into planning my own designs (gasp!). How do you plan your quilts (and with coloring, esp with pieces so, so small!!)? Hi Lori, the color scheme isn't my idea. I found it on Anina's That Quilt blog, she did a rainbow jane block of the month, and although I didn't join the block of the month, I am going to use her color scheme. I think that you will be fine, your blocks are lovely! Holy cow, this is IMPRESSIVE. Good luck - I can't wait to see how it progresses. It's such a gorgeous design. I'm sure you'll do fine with it, and think of how precise you'll be by the time you're done! Nettie--I literally gasped out loud when I saw your drawing. It's absolutely gorgeous. And intimidating. But mostly breathtaking. Best wishes! Good luck! What an ambitious challenge, but how amazing you'll feel when done. I recommend that you buy a Steady Betty for your pressing on pieced blocks. It will really help with your precision. Also, buy tons of spray starch. I really must say that your color scheme is so much more appealing than that original quilt. Your squares are also so nice and bright! Love your website! I've been wanting to try this too! Maybe you'll give me the courage to do so! I am glad you joined us in the crazy DJ journey! Don't give up. I have been working on mine for a LOT of years but I figure it is slowly progressing and that's good. It will be done eventually. So even if you have some lulls don't give up! You will be so proud of yourself and learn so much along the way. I'm about to start this one too. A little scary but I really want to finish this amazing quilt. Check out my newest and first quilt! Oh wow, what fab colours. It's great to see another modern Baby Jane being started! I love this quilt! It is beautiful and so intricate! WOW! I can't wait to see it done! Oh don't give up! you'll love it . I started mine last year I've done about eighty, some the wrong colours. I could't decide. I did start sewing them on the machine but to fiddly for me. so now i do them by hand so much easier. So now i sit in the evening and hand piece them while i listen to the TV........... Not much watching goes on. lol. The nice thing about them being small is you can put them in a zip lock bag and take them with you where ever you go. Don't give up -- this will just be a long-term commitment :) I *love* the color scheme you chose/borrowed: it's going to be a beautiful quilt, and will document a nice hefty period in your creative life....Have fun! i can't believe you jumped in! good for you! i've wanted to off and on, but i'm still quite chicken. this quilt holds a special place in my heart, and i'm happy to see someone in the modern generation taking it on. My longterm hs & college boyfriend's mom was an amazing quilter, and she was a contributor to the book (Rebekkah's Basket block. She has since passed away and I've promised myself that i WILL make this quilt some day! persevere, Nettie. you can do it! Your Dear Jane is going to be one of the most spectacular Dear Janes I've ever seen. Looking forward to seeing how it comes together. You are doing a fantastic job. Oh wow, that is amazing & going to be beautiful when you're done. 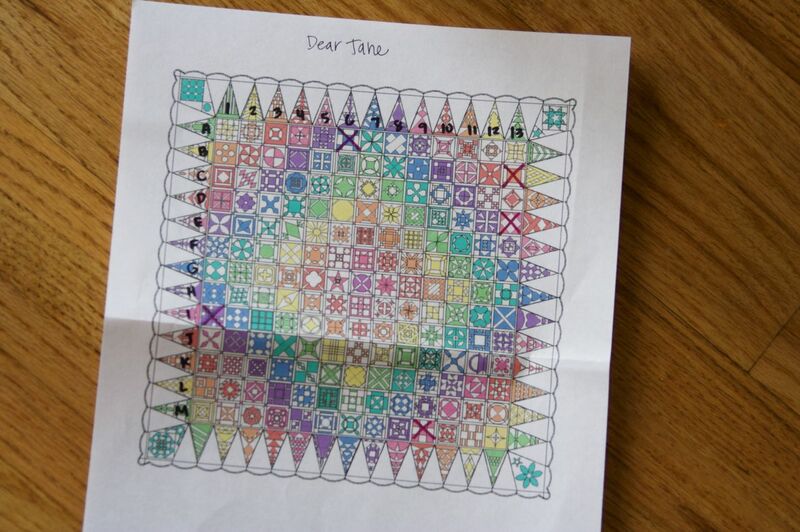 I've never seen or heard of the Dear Jane quilt before, thanks for sharing! I am very tempted to start a Dear Jane quilt. I've gone back to the main website many times looking over the blocks trying to convince myself that I can do it. It will be beautiful when you finish. Keep it up! I can't wait to see it completed. 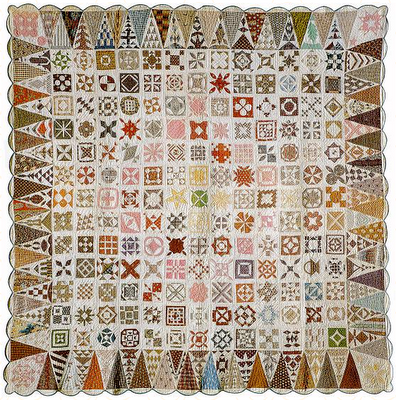 I love Dear Jane quilts and I always love the colors you use.